This short film will archive the moving story of a community coming together to make a huge difference in the lives of hundreds affected by this historical event, empowering individuals and communities alike to take action when action is needed––natural disaster or not. The filmmakers are crowdfunding to raise $25,000 to enable completion of this important work. Digging a community out of natural disaster isn't the easiest work, but for many of those who picked up phones or shovels to take part in this effort reported it was one of the most rewarding experiences of their life. 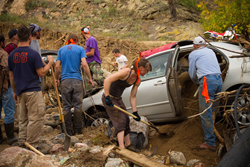 In September of 2013 catastrophic flooding struck Colorado’s Front Range. President Obama declared a state of emergency and released the National Guard and FEMA. Entire communities were cut off when raging waters swept away mountain roads, and over 19,000 homes were damaged. connect those who needed help with those who wanted to give it. It took off. Almost overnight, this group of friends was running a large scale disaster response effort that pulled in strangers and friends alike, despite very little collective experience in either disaster relief or volunteer organization. It was a crash course in disaster response and community rallying. The Mudslingers became the subject of many news stories, including NBC's Nightly News and the Today Show. At its peak, the group was comprised of hundreds of volunteers. They helped upwards of 400 homes in Boulder County. Digging a community out of natural disaster isn't the easiest work, but for many of those who picked up phones or shovels to take part in this effort reported it was one of the most rewarding experiences of their life. To help support the production of Knee Deep and share this story of action and community, individuals can donate to the Kickstarter campaign at http://kck.st/1lPW3JF. Pledges will be accepted thru 10am MDT, Friday, July 25th.